Fits standard 3-prong C6 "cloverleaf" connectors; Dell, Compaq and many others - Great for traveling! - $5000 Connected Equipment Warranty by manufacturer. Tiny ElectraShields protect your laptop computer and other sensitive electronics that use C6 and C8 power cords from the damaging effects of power surges and spikes. 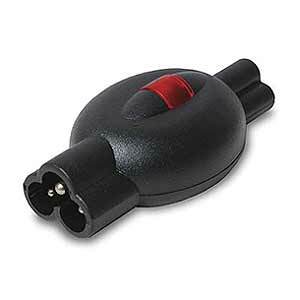 Connect one between your power cord and power brick and a surge active indicator light lets you know it's protecting your computer. Following a destructive surge that would have likely damaged your valuable electronics, the indicator light will go out indicating that a surge has occurred. To protect against future surges, please immediately replace the unit.